Over the past six years, students across Brandeis University have launched 20 startups in more than 200 hours of non-stop entrepreneurship through our 3 Day Startup Challenge (3DS). Will your idea be next? The 3 Day Startup (3DS) program aims to create a living entrepreneurship laboratory on university campuses by bringing together students with diverse backgrounds ranging from freshmen to freshly-minted PhDs. Participants gain experience in cross-disciplinary collaboration, brainstorming and ideation, and group productivity, including ad-hoc leadership under severe time constraints. They also become a proud partner of a startup, ready to be launched at the end of the event. To add to this, participants gain tremendous opportunities to network with mentors who are thought-leaders and experts in the field of entrepreneurship. We partnered with MassChallenge again this year to advance the winning team into the second round of the MassChallenge accelerator program. We teamed up with the Brandeis MakerLab to provide participants with the opportunity to further develop their ideas with 3D printing and graphic design opportunities! The Asper Center for Global Entreprenuership awarded $3,000 in startup costs (in-kind)! 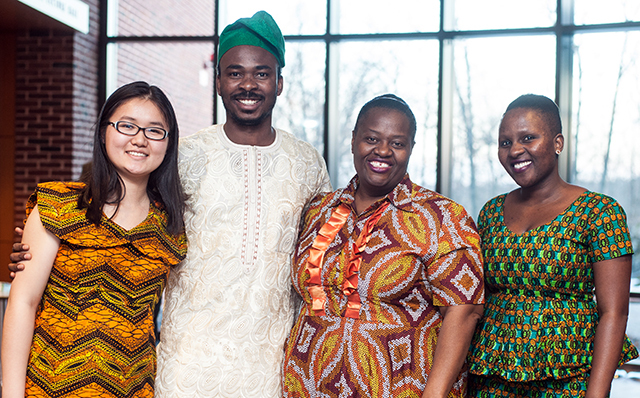 The winning African Women Energy Solutions team (left to right): Weiwei Jian MA '18, Gbenga Oni, Enet Mukurazita, and Priscilla Rwandarugali. First Place: African Women Energy Solutions - biogas digester integrator to provide renewable energy for rural African communities. Advanced into the second round of the MassChallenge accelerator program. Second Place: Genuinely Crafted - subscription box services with handcrafted, artisan products from Southeast Asia. Awarded $1,500 in startup costs (in-kind). Third Place: Game of Shows - app that allows TV viewers engage deeper with their favorite show by betting their friends. Awarded $750 in startup costs (in-kind). Fourth Place: LatamBiz - SaaS database of Latin American startups for investors around the world. Awarded $500 in startup costs (in-kind). Fifth Place: SpotDeals - app to connect consumers to relevant deals using real-time offers, gamification and augmented reality. Awarded $250 in startup costs (in-kind). A startup that aims to present opportunities for work and income to skilled refugees using remote microtasks assigned by U.S. companies. A mobile platform designed to pair users with up-and-coming fashion designers or stylists to help them with what to wear. A daily wardrobe application that helps users gather votes, reviews and comments from friends, the public and community members on their daily outfits. A mix between social media and a political news website with content generated by citizens. Questions about the competition, workshops, or application process? Contact the Entrepreneurship & Innovation Lab (EIL): eil@brandeis.edu. The Brandeis MakerLab 3 Day Startup Workshop was held on Friday, March 2, 2018. To learn more about the MakerLab please visit their website or email makerlab@brandeis.edu.